Seasonal contrast is something I cherish – up to a point. Come July, the joys of winter are starting to wear a bit thin and I’m dreaming of a summer holiday in the northern hemisphere. Just as well nature has ways of cheering us on – I wouldn’t be without those early trumpet daffodils and my daphnes wafting their scent about in the cool grey air. In my garden, it’s the first week of July when Daphne odora “Leucanthe” and D.odora “Leucanthe Alba” finally burst their buds. The odoras are by far the most widely grown daphnes and it’s not hard to see why. The sheer power of fragrance from such a compact shrub is hard to match at any time of year, let alone winter. A single sprig in a vase emits a perfume that belies its size. Daphne x transatlantica 'Eternal Fragrance' has been a sensation overseas and some plants will be around this year but only in very limited numbers. More plants will be available next year, it's definitely a plant worth waiting for. Even when not flowering, the odora daphnes are tidy, compact and evergreen. But they’re not the only daphnes worth planting. The world’s gene pool consists of more than 50 species. A fair number of these, and some excellent garden hybrids, are grown in gardens around the world. Some of these treasures can be found in New Zealand. The daphne of my earliest memory grew in a strip of shade-lovers beneath a childhood bedroom window. Apart from the wonderful smell, I loved the pretty white-edged leaves and rosy pink flowers, each tight cluster the size of a doll’s bouquet. I know it now as Daphne x burkwoodii ‘variegata’. 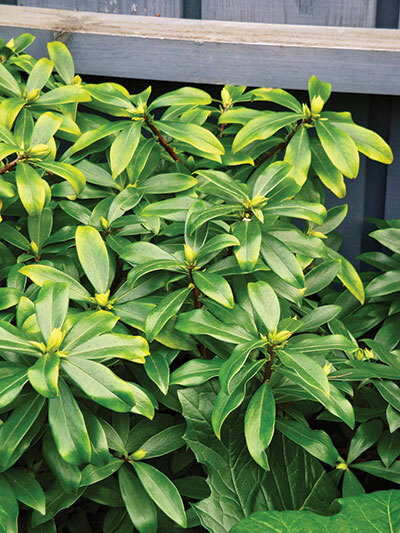 Generally, I prefer the green form of a shrub over yellow splotches and stripes, which can overpower the flowers, but in the case of Daphne x burkwoodii I think the fine creamy-white leaf margins add to the whole effect. Green-leafed forms include ‘Albert Burkwood’ and ‘Somerset’, slightly larger. A little taller, quicker growing and slightly later flowering than the odoras, the Burkwoods are also semi-evergreen. The colder the winter the more leaves they will drop but they are very cold tolerant (more so than odora varieties, which are sensitive to extreme cold). Daphne x burkwoodii cultivars result from a cross between D. cneorum and D. caucasica. The latter is enjoyed in some gardens for its blue-green foliage and small white flower clusters. D. cneorum, which grows high in the Pyrenees and the European Alps, is better known, if not always easy to grow. 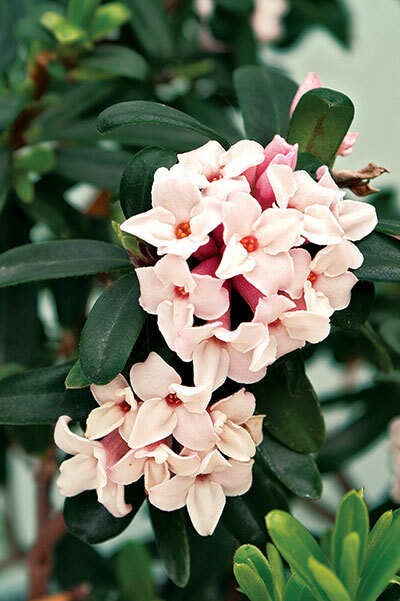 Also known as rock daphne, this low, groundcover shrub has masses of bright pink, very fragrant flowers in spring. It is very cold hardy (copes with snow) and capable of repeat flowering in autumn but can be tricky to establish. It demands excellent drainage and prefers cool, moist soil with protection from hot afternoon sun. There is also a variegated form. The further south we go in New Zealand, the more likely we are to come across a wider variety of daphnes. D. mezereum loses its leaves in autumn and flowers in winter on the bare wood. Himalayan D. bholua is said to be the most fragrant, even more so than the odoras, and also very long flowering. In the wild, D. bholua grows at altitudes of 1800m to 3100m and flowers for half the year from autumn to early spring. This is a tall shrub (up to 2m) and deciduous, so not for every garden, but in large gardens it makes a fabulous space filler or background shrub, filling the air with its potent perfume in late winter. In Nepal, D. bholua is one of five daphne species used to make a traditional handmade lokta paper, prized for its great strength, beauty and long life. The bark is cleaned and chopped, soaked in water then cooked in a soaking solution of hot water and soda, turned into a pulp and then poured into wooden frames for drying in the sun. Because D. bholua will regrow after pruning and self propagates by seed, it is touted as a renewable resource. There are reports of steps towards better management, as over-harvesting in the past has seriously depleted this commercially important resource in some areas. Imagine the smell of an entire plantation! Another Himalayan forest species is the compact little evergreen D. tangutica. It has leathery leaves and flowers profusely in spring when deep purple buds open to sweetly fragrant rosy-purple flower clusters. These are followed by scarlet fruit. Colour, not scent, is the main event for the exceptionally beautiful D. genkwa, a must-have for the connoisseur collector. It looks more like a lilac than a daphne. Only faintly fragrant, it is grown for its mass of radiant lavender-purple flowers, which appear before the leaves, a rare treat in the early spring garden and beautiful in a vase. This highly prized Chinese native is quite rare in gardens because it is difficult to propagate and by all accounts can be a temperamental shrub to grow. A warm summer and well-drained soil are essential, but it is frost hardy when dormant. Plant in cool, lime-free soil, enriched with plenty of organic matter. Neutral to slightly alkaline soil suits most species. Drainage is paramount – daphnes hate wet feet. Once established, they are more likely to succeed in relatively dry conditions than soil that lies wet in winter, although D. mezereum is more tolerant of heavier soils than other daphnes. I’ve grown them successfully close to the south wall of a house. My current daphnes are thriving in the shelter of some deciduous trees where the soil is heavily mulched with fallen leaves. If you have heavy, wet soil, try planting in raised beds or on mounds. Part shade is best. Most daphnes don’t perform well in direct, all-day sun, which is one of the reasons the leaves can turn yellow. On the other hand, dense shade will reduce flowering. Maintain a layer of organic mulch, such as leaf mould or fine bark. Top it up each year but don’t pile it up around the stems. Nutrient imbalances caused by high pH and/or poor drainage result in yellow leaves. If your soil is well-drained but yellow leaves persist, try a dose of iron chelates to correct a possible iron deficiency. Trimming lightly after flowering, or simply picking the flowers, helps to keep growth compact so no one will be tempted to “tidy things up” with a fatally heavy prune. Daphne odora 'Leucanthe' in its summer plumage. Are you a daphne killer? My husband is. I am over it now and, as one who learns quickly from his mistakes, he now knows that most daphnes will not grow from stumps. It’s many years since he took the loppers to a handsome pair I had established beautifully either side of our front entrance steps (and we all know how difficult it can be to achieve perfect symmetry). But, in truth, you don’t have to be a lopper-happy gardener to lose a daphne. They are renowned for their ability to turn up their toes overnight. Most of the time it comes down to drainage, because daphnes are prone to root rot, but sometimes they’re just plain fickle. As insurance, you could try planting daphnes in more than one spot. They also have a reputation for being short-lived. If your healthy daphne is getting on in years, you might want to get another one growing, just in case. Seven years is considered a good innings, although they can live much longer. It’s also worth noting that Daphne odora ‘Leucanthe’ is a far more reliable plant today than it may have been in your distant gardening past. Until the advent of tissue culture solved the problem, many cutting-grown plants had become infected with virus towards the end of last century. That said, in 20 years of planting daphne, the “lopper incident” has been my only woe. Get the planting position right and your daphne, once established, may require no further attention other than a little feeding and mulching.